The scenery changed very dramatically when we left Northern Portugal for Spain. Bright green hills morphed into the flat arid plains of central Spain. When we drove through this region in the mid-1980’s we saw some of the most depressing little towns in Western Europe. These impoverished dusty towns appear to be a thing of the past. Our first stop was Zamora. We chose it because it was a convenient stopping point and known for a 12thc. cathedral. We hadn't expected it to have such an incredibly beautiful old town. 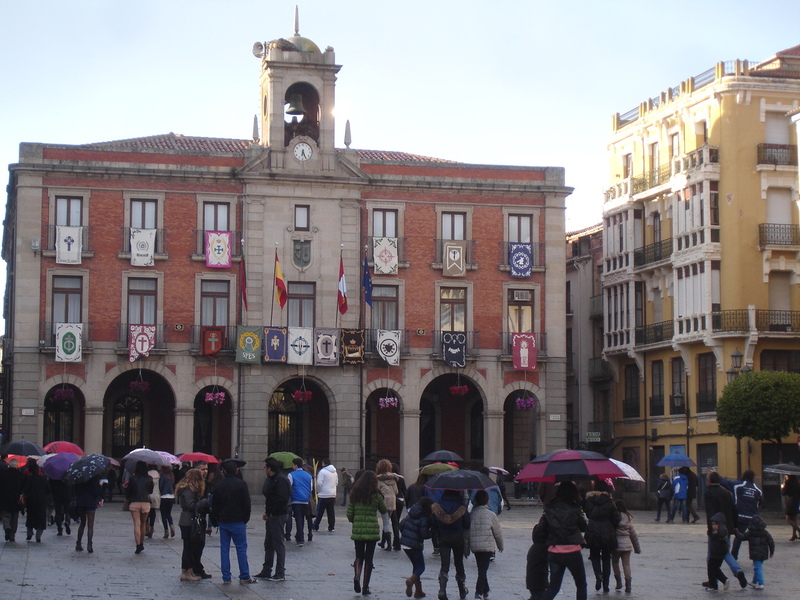 Like Salamanca, the buildings were all golden sandstone; unlike Salamanca, we saw the historic center shimmering in sunlight. The Michelin guides can usually be counted on to identify major cultural treasures but they fell down on the job in their description of the cathedral at Zamora simply stating: “The principal exhibit in the cathedral museum is a series of 15thc century Flemish tapestries.” What an understatement! With perfectly preserved jewel like colors, these were among the most beautiful tapestries I’ve ever seen; the museum guard called them the most beautiful in the world and he may have been right. It is worth the trip to Zamora for the tapestries alone. 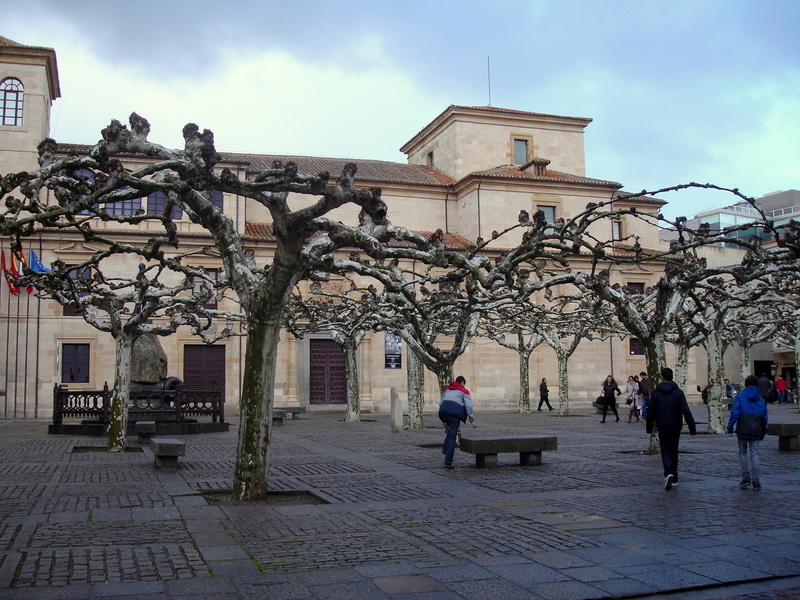 And if we ever make it back to Zamora, I would definitely stay at the Paredor, a very beautiful old manor house right near the main square. 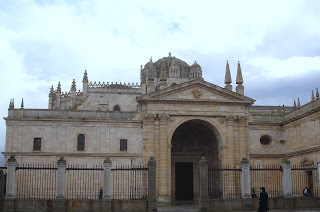 The drive from Zamora to Toledo was our longest driving day so we broke it up with a stop at Salamanca, hoping to catch Salamanca on a sunny day. 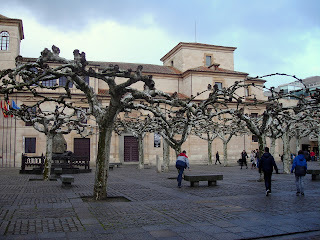 Unfortunately it was another rainy day in Salamanca, but the town is so beautiful it didn’t really matter. And we did get a ray of sunshine for about two minutes. Salamanca on a brilliant sunny day may be one of those travel experiences which will forever elude us. 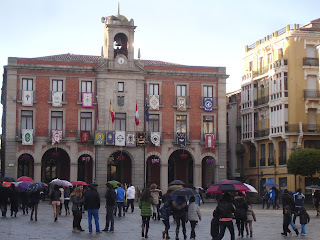 We would have liked to linger in Salamanca but we had a two and a half hour drive to Toledo ahead of us.